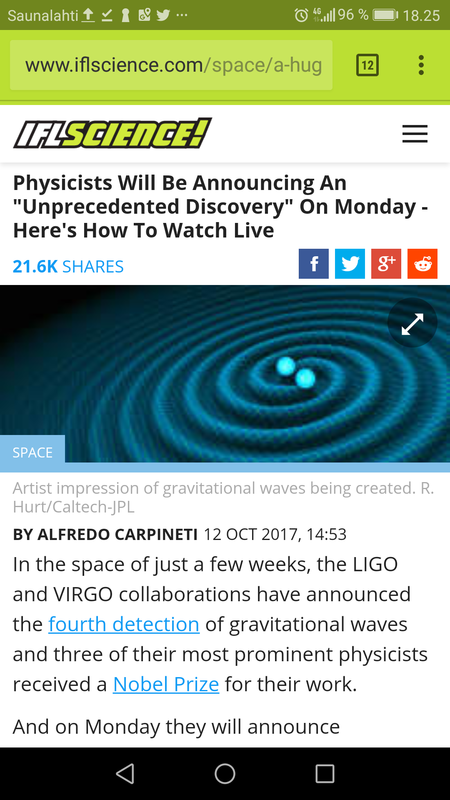 In the space of just a few weeks, the LIGO and VIRGO collaborations have announced the fourth detection of gravitational waves and three of their most prominent physicists received a Nobel Prize for their work. And on Monday they will announce something new. Astronomy is about to change forever. At 10 am EDT (3 pm BST) astronomers around the world will present the groundbreaking observations of an astronomical phenomenon which has never been seen before. Four times in the past 2 years, physicists working with mammoth gravitational wave detectors have sensed something go bump in the night, sending invisible ripples through spacetime. Today, they announced the detection of a fifth such disturbance—but this time astronomers saw it too, at every wavelength of light from gamma radiation to radio waves. Just as physicists had predicted, the unprecedented view of the cosmic cataclysm—in which two superdense neutron stars spiraled into each other—brought with it a cornucopia of insights, each of which by itself would count as a major scientific advance. The fifth observation of gravitational waves (GW) marks the beginning of a new era in astronomy. On August 17, 2017, the LIGO and VIRGO collaborations detected neutron stars merging for the first time and immediately alerted observatories around the world. In a matter of minutes the event had been located, another first for GW astronomy, and telescopes around the world begun studying it almost immediately. The event observed, called GW170817, was produced in galaxy NGC 4993, located 130 million light-years from Earth. The event, which allowed scientists to confirm that gold and platinum are formed in such collisions, marks a new approach to astronomy where different forms of observation are used to create a detailed picture of what’s happening.